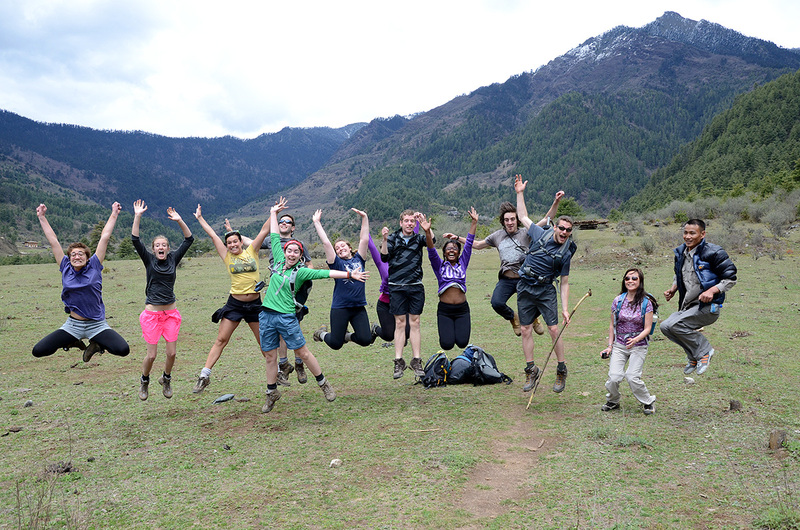 On the fifth day of our Spring Break excursion, the entire Wheaton group along with Professor Owens and Tsewang ventured off to begin our first and only collective hike of this trip. With numerous activities on today’s itinerary, we had an early start to the day. Our gracious host family had a delicious breakfast prepared for us; fried rice, eggs, pancakes, and honey were on the menu. After we had our fill, we began our daylong hike. 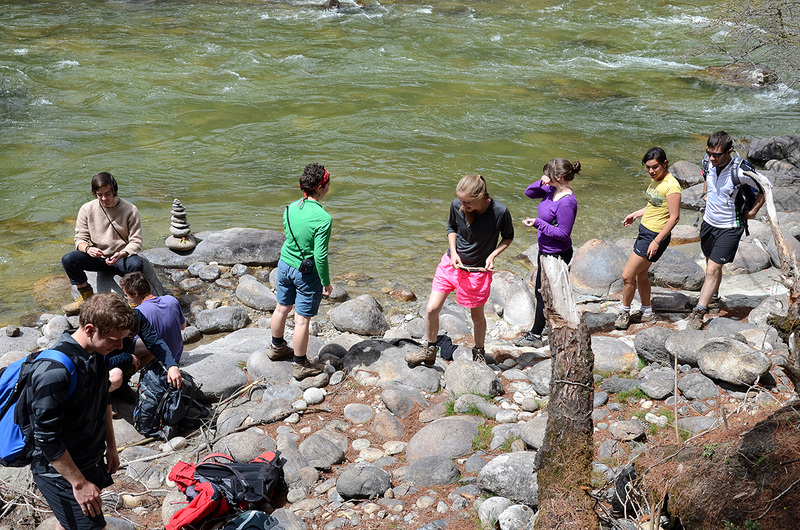 We started off walking through the woods and arrived at a river that extended for kilometers on end. 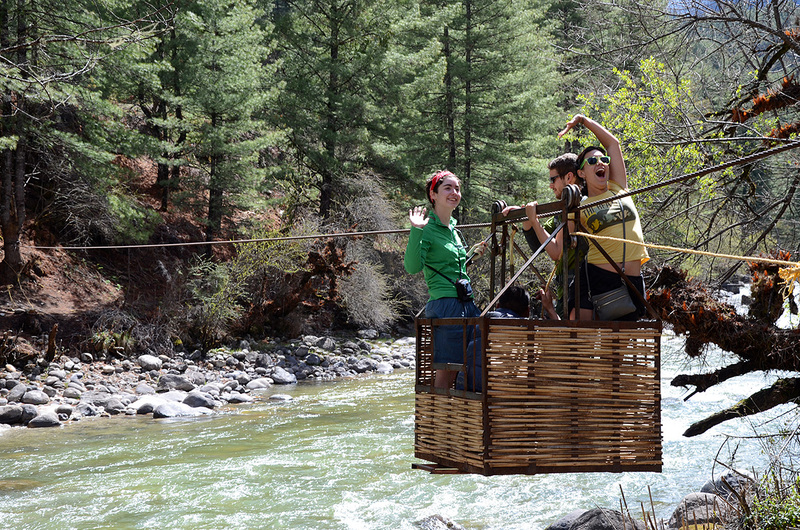 Attached to one of the trees elevated near the river was a basket with an iron-wrapped zip line that extended to the other side of the river. Having seen pictures from friends who have gone to Bhutan previous to me, I was deeply anticipating this part of the trip; we would be taking the basket across the river. In groups of four, we all got across safely and soundly although some would argue the dismount to be quite inconvenient for the shorter crowd. Nevertheless, the experience met its high expectations. Once we all got across, Tsewang informed us that the grassy area that we were standing on was to become the future GNH center. Once we got across, we continued trekking along the river and through the enclosed canopy of over-towering trees. Finally, we emerged from the forest and came to a beautifully open pasture. We stopped every so often to take pictures of the rugged landscape dotted with grazing cows. A photo opportunity was necessary. 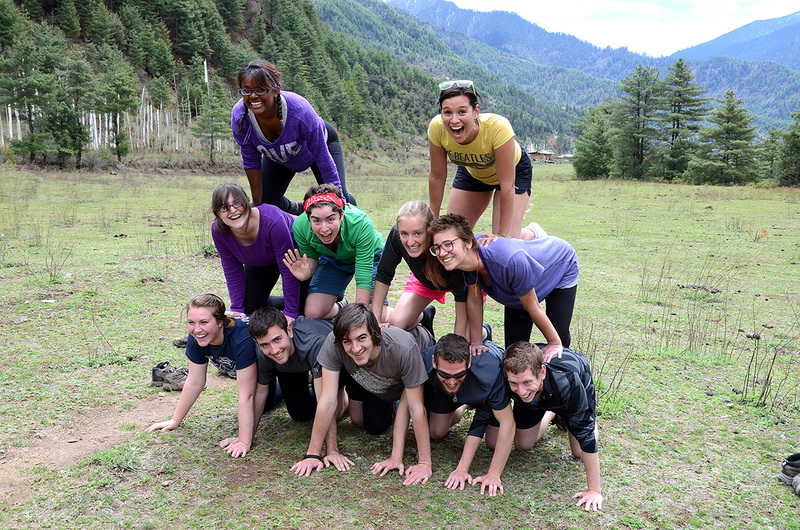 A simple group photo surely would have sufficed but to commemorate Ana’s 22nd birthday, we decided to tackle the unruly task of building a human pyramid. It was tough but successful in the end and Professor Owens got some pretty great money shots. 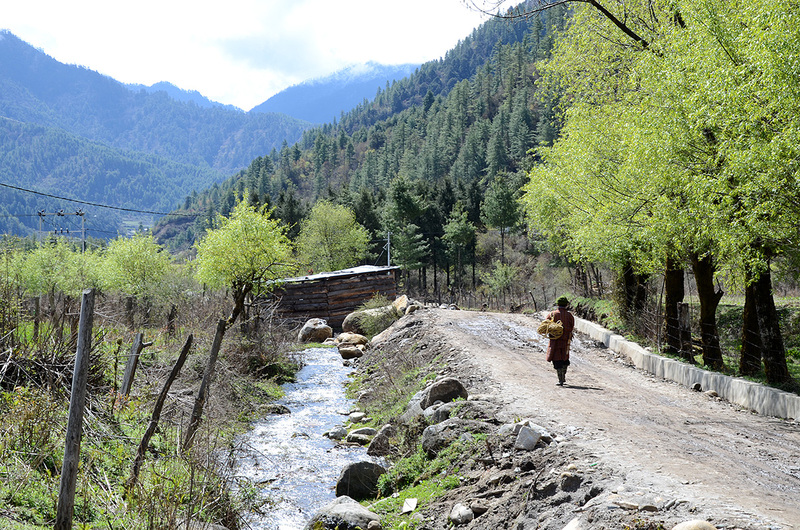 We continued on along winding dirt roads through the Bhutanese countryside. The small valley was filled with patchworks of green fields and scattered farm houses. The occupants of the small villages we passed paused from their daily duties to give us a friendly wave or utter a quiet “Kuzuzangpo-la”. The country road continued past a small village, gradually becoming narrower until it reduced to a simple dirt trail through the forest. The trail began to ascend, switch backing up a steep hill. 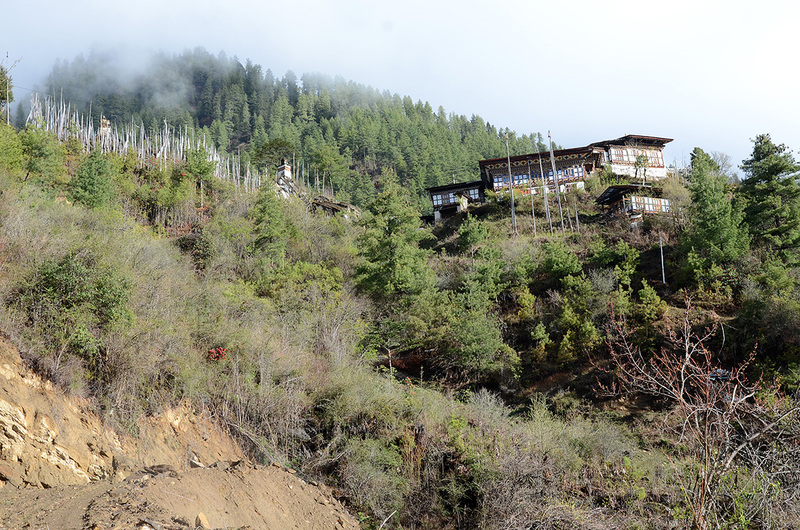 We passed by a small complex of low buildings, which served to house the archeologists studying the ancient dzong. No archeologists seemed to be about today however, either they had the day off or were just sleeping in really late. At the top of the hill there was a network of crumbling stonewalls, with the ruins of the ancient Drapham Dzong at the center. The scene had a hushed air of antiquity about it. Faded and torn prayer flags draped from gnarled trees and flapped in the wind. 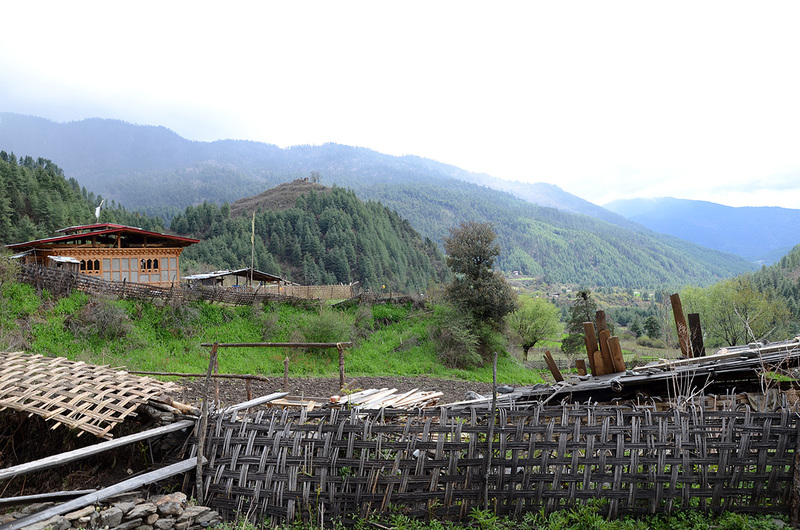 The dzong itself had seen much better days long ago; time had reduced it to a fragmented shell of its former self. Cracked stairs led into the dzong, where old timbers and plants poked out from between the stones of the walls. 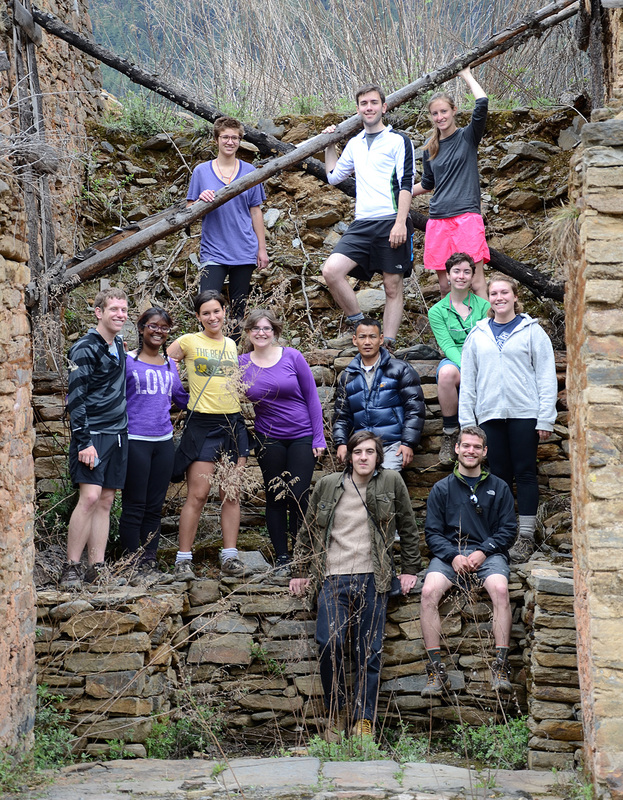 Carefully climbing to the top of the crumbling ruins allowed for an enhanced view of the surrounding countryside. 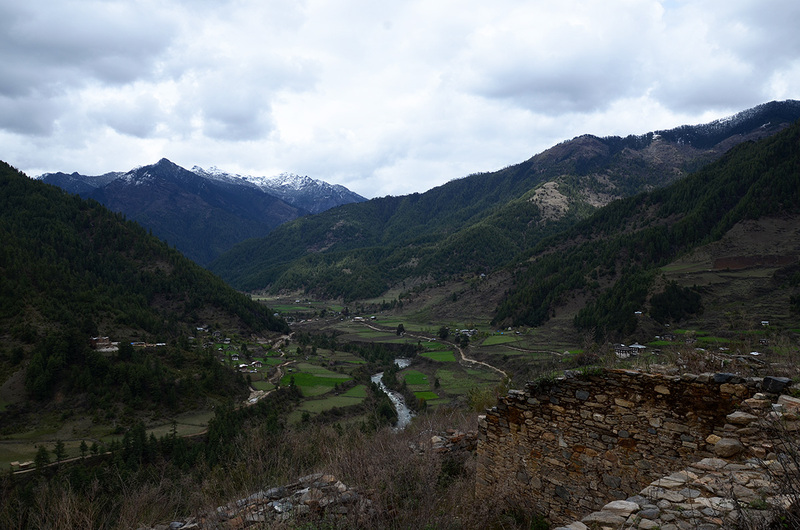 The dzong was strategically located, with a commanding view of the greater river valley. It must have been an imposing sight long ago, visible up and down the valley atop a steep hill. However, the prime location had not saved the dzong from destruction, as Tsewang informed us that it had been on the losing side of some ancient conflict, its name meaning “fortress of the defeated enemy”. 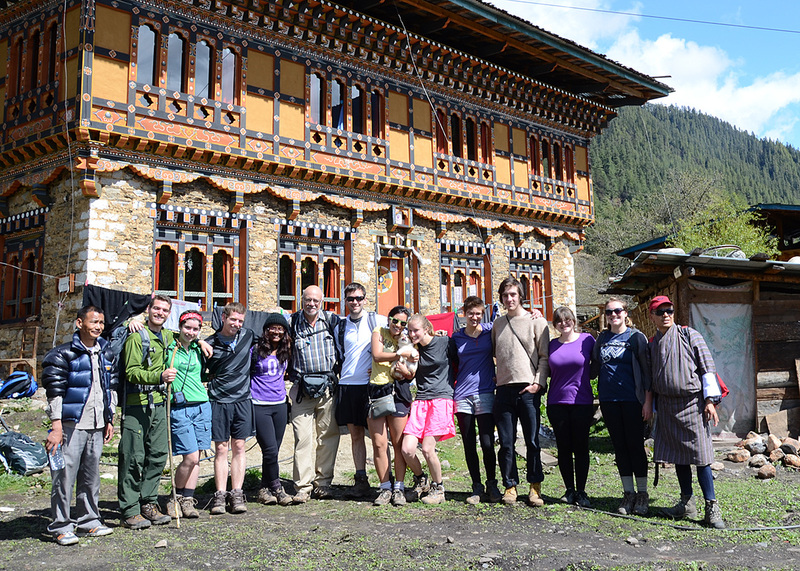 After we had had sufficient time to explore what remained of the dzong and admire the surrounding country, we descended the hill and returned to the small village we had passed through earlier, where our hosts from the farmhouse met us with our lunch. After a hearty meal consisting of enough of Bhutan’s famous red rice to feed about fifty people, we paid a visit to a nearby temple. The temple, when its name (Ngang Lakhang) is translated into English, is known as the temple of the swan. This temple stands out in Alec’s memory from the multitude of others that we visited over the course of our week-long adventure. Intricate and colorful paintings lined the walls, depicting scenes of the wrathful and peaceful deities along with other Buddhist saints. The figures in the paintings appeared slightly warped due to the uneven surface of the temple’s stonewalls. A statue of Guru Rinpoche flanked by his two consorts dominated the main altar. Two other figures sat on the periphery of the altar, one a likeness of a Tibetan king and the other a Tibetan Buddhist lama and teacher, both of whom played a role in the Guru’s coming to Bhutan. Among other religious artifacts in the temple was a stone bearing the foot impressions of the Guru’s consorts. Rocks with body impressions of holy historical figures are a common sight in Bhutanese temples; we observed a multitude of them over the course of our week-long excursion. 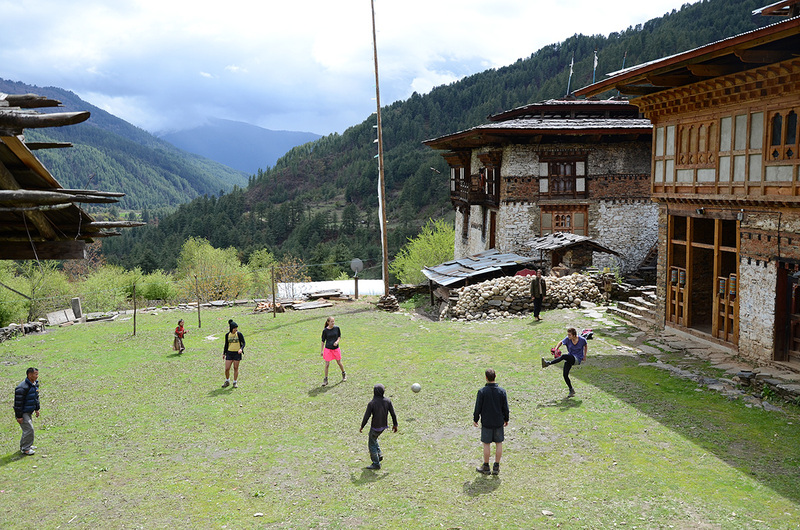 When re-emerged from the temple we discovered that a group of village children had gathered in a field outside to play football. We happily joined them and kicked the ball around for a bit before we had to continue on our way. Instead of taking the same route back to our lodging, we crossed over the river, this time by bridge, to the other side of the valley. I must say that walking through the countryside was a very welcoming break to our usual automotive mode of transport, our tour bus. On our hike back to the farm stay, Tsewang was quick to usher us back into our farm stay to change into “Dzong appropriate” clothing. He informed us that today marked the death anniversary of his teacher and that a ceremony would be going on. Some of us were tuckered out after the long day of hiking and decided to stay behind, while the rest of us tagged along with Tsewang for a brief hike through the village and up the mountain. Although short, the walk proved to be a little difficult because of the extensive rainfall that occurred over the course of two days. Within twenty minutes, we finally made it with no casualties. Once there, we were greeted by the family of the late teacher and they took us to the alter room where we were treated with our group favorite; tea and crackers. We sat there momentarily, soaking in our surroundings. The room was captivating; every spectrum of color seemed to be present and it was easy to spot some of the masks that we saw at the Domkhar Tsechu a few days ago. 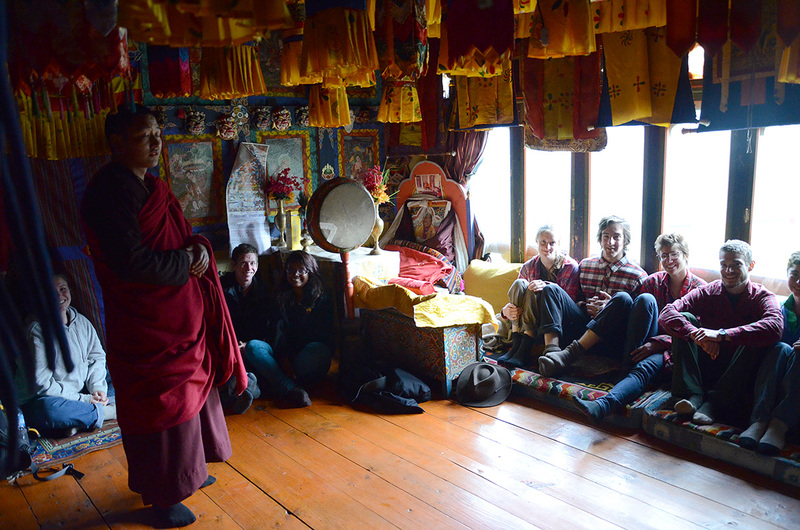 As we socialized, the monk brought ara (a traditional alcoholic beverage from Bhutan) to the group; some hesitantly took while others eagerly declined. Afterwards, we were taken to the room where the ceremony was being held. There were four monks situated at the front of the room, each with an instrument. The wife of the deceased was sitting near them, holding prayer beads and murmuring prayers. The ceremony began and the monks started to recite their prayers. While this ceremony progressed, a monk put out a table of candles and each individual our group received the opportunity to light one. Food that was previously sprinkled with holy water was passed around and we each took the one that attracted us most. We were surprised by the informality of the ceremony; the monks would occasionally stop in the midst of their prayer to cough or speak to their neighbor. It was clear; the informalities only emphasized the fact that the ceremony was taking place solely to remember the life of a great individual. 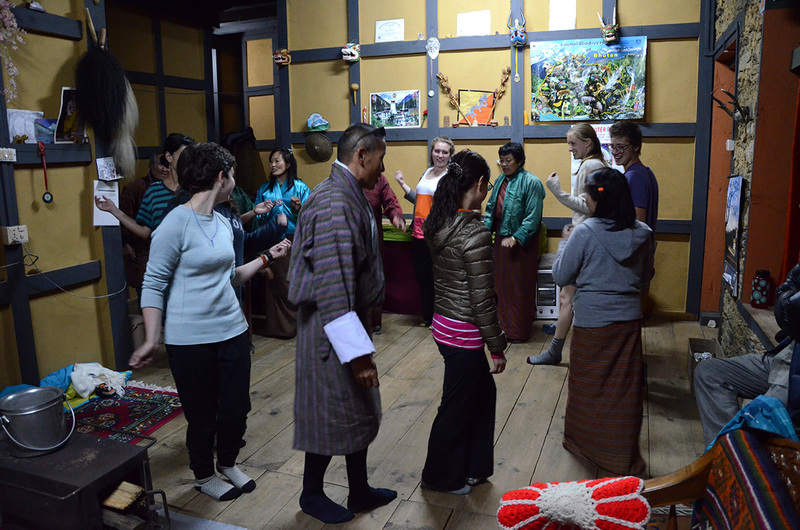 After the ceremony, we were taken into the shrine of the protective deity. This was an honor for us to enter because we usually are not allowed to enter such shrines. 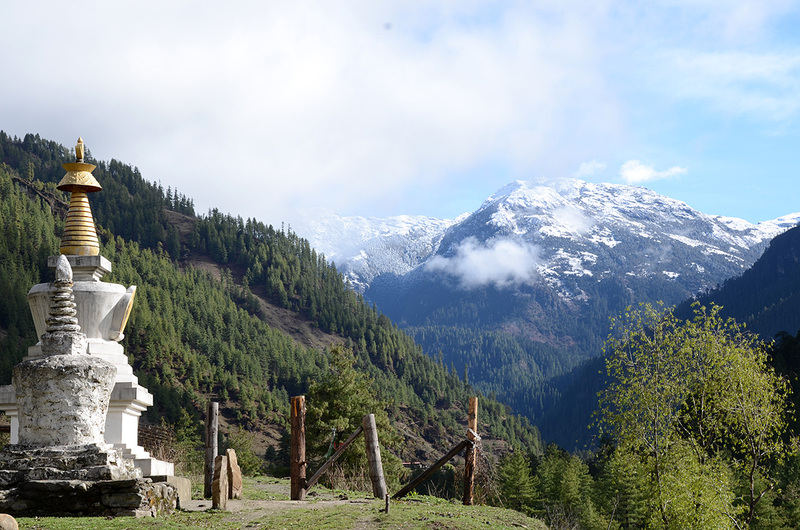 But Tsewang’s teacher believed that if Guru Rinpoche’s consort went with him wherever he went, then his consort should be able to as well, and by extension, the shrine should also be open to us. We were all pretty surprised by the opportunity and realized that we will probably never be able to walk into a room like this again. After we got a few hours of relaxation in, our host family cooked up a dinner for champions; red rice, ema datsi, carrots, potatoes, and pork. 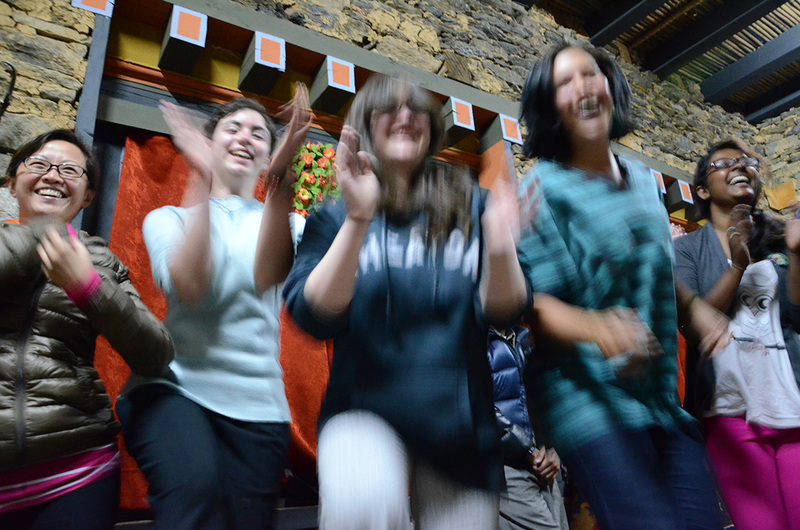 After having second and third plates of food, our hosts’ decided to engage us in several forms of traditional Bhutanese dances. While the girls of the group instantly shot out of their seats to join in, the guys sat back and looked at one another nervously, not knowing what to do. 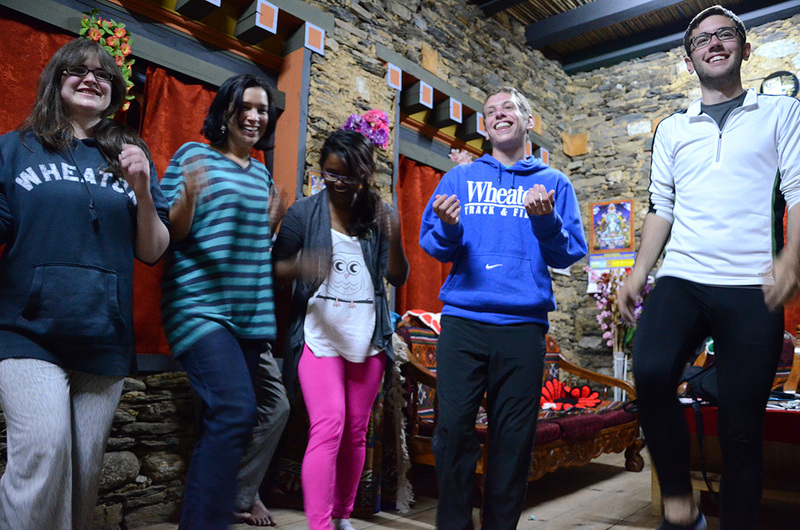 Eventually, everyone joined in on the festivities as we spent hours that night, learning traditional choruses and making complete fools out of ourselves (sadly with pictures and videos to prove it). It was a wonderful way to wrap up the night and the end of our farm stay.